Though I’m writing about my adventures in Utah, in actuality, I’m home in Minnesota. I got home last week after 2 months of traveling around the western USA. It feels good to be home. Well, let me refresh your memory real fast. In my last post, I wrote about my experiences hiking in Arches National Park and Canyonlands National Park. After spending time there, I camped at White House Campground (If you search for it, you’ll see that I wrote a google review for the campground. It’s my first review ever! I decided to write one because it didn’t have a review and I think travelers should know there’s a well-maintained, cheap campground near so many national parks). If you have never been to Zion, then you must go. 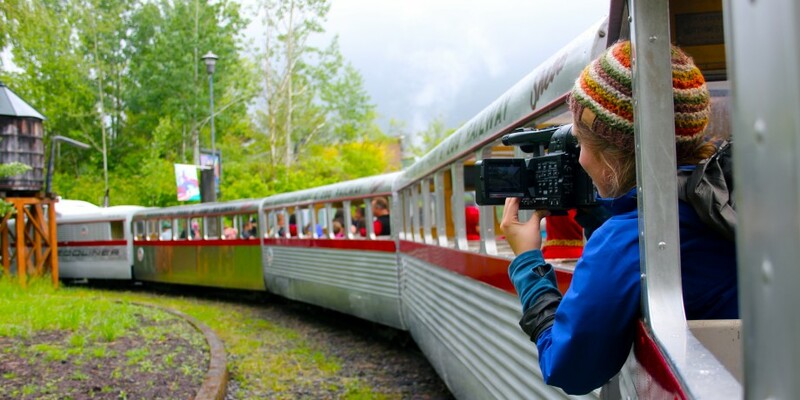 Make it the next on your list of places to see. There is something so stunning and so magical about Zion. Maybe it’s the sheer size of the cliffs that you’re hiking beside or maybe it’s the pristine mountains that flank you on both sides or maybe it’s because every view looks like a priceless painting. My brother and I couldn’t keep our mouths shut because we were gawking everywhere we looked; from the shuttle bus to the Narrows, our jaws were ajar, awed by the surrounding scenery. When we got past the eastern entry point, we stopped at a few lookout points. Each one had their own unique history to share and horizon to see. This is where I learned that many of the mountains I saw were gigantic petrified sand dunes. Woah. The landscapes were so massive. Our cameras couldn’t do them justice. We learned that there is parking available in the park, but it is very limited. We ended up driving out of the park from the southern entrance and finding a parking spot about a quarter mile away. There’s a free shuttle that goes from Springdale to Zion, which is a great alternative if you happen to be coming from the south. 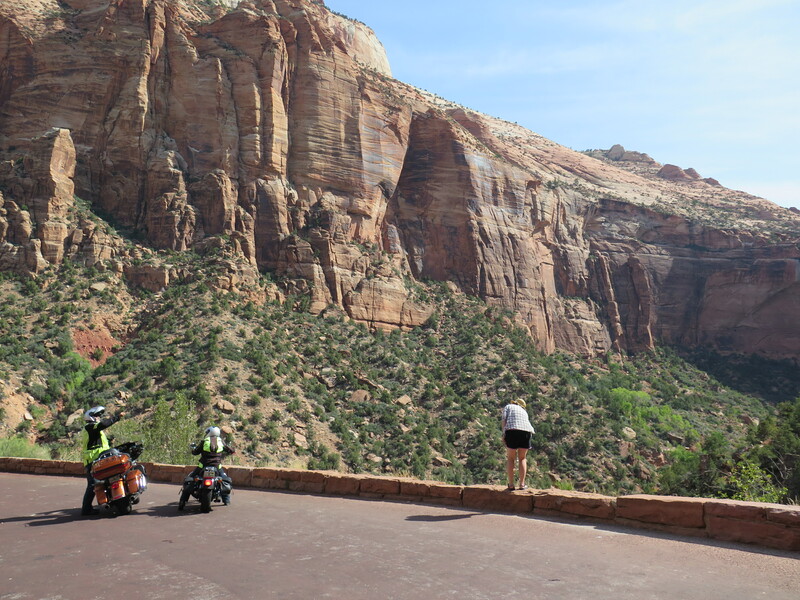 Once you’ve parked and have entered Zion, then follow signs for the park shuttle. It’s the best way to get around while in the park. My brother and I found a map and decided to start from the last stop of the shuttle and then to check out the other stops as we returned back to the entrance. The last stop was The Narrows. My brother and I got off the bus, refilled our water bottles and started our 2-mile hike at the Riverside Trail (Gateway to the Narrows). Though it was a really hot day, the path was shaded by the nearby cottonwoods trees and a nice breeze whistled through the canyon. The farther we went, the narrower the canyon got. Though it was still quite large, it was evident why this trail is called the Narrows. We reached the end of the Riverside Trail and found the Narrows trailhead. My brother and I didn’t come prepared, so we didn’t hike in, but I’m glad I got to see it. 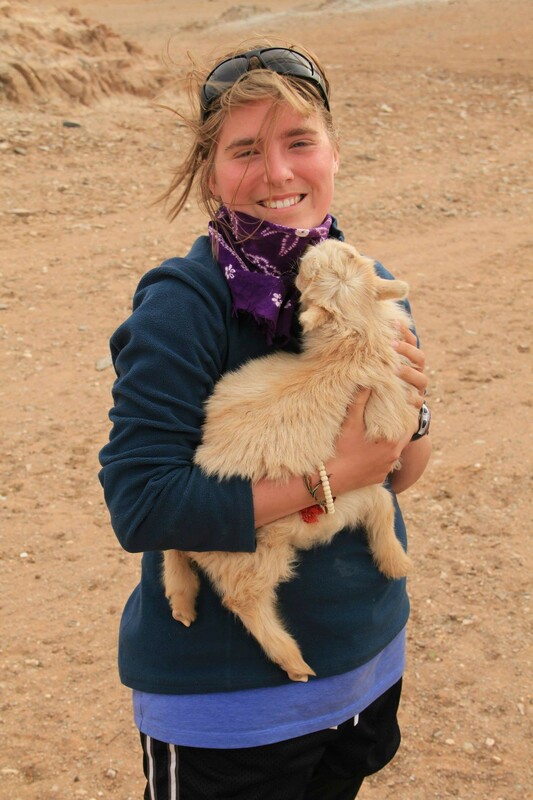 I know I’ll be back in Zion sometime soon (hopefully with my adventurous sister) and I plan on hiking the Narrows then! My brother and I hiked back and jumped in the shuttle bus to our next destination: Weeping Rock. We saw that it was a .4-mile loop with 100 feet of elevation gain and decided we should check it out. This hike is famous for the small streams that trickle down the side of the canyon, resulting in a weeping rock face. Also, since there is so much water, ferns and mosses grow all around, creating a green paradise hidden away in the sandstone cliffs. This was the perfect place to cool down after hiking a couple hours in the sun. The gentle drops of water cooled our burnt skin and the views of the park were spectacular. (A few images above is from Weeping Rock). For our final hike, Jamie and I decided to check out Emerald Pools. We took Kayenta Trail from the Grotto area towards the Emerald Pools – Lower Trailhead. This hike was the most visually stunning of all the hikes we did that day. The trail was pretty easy too. 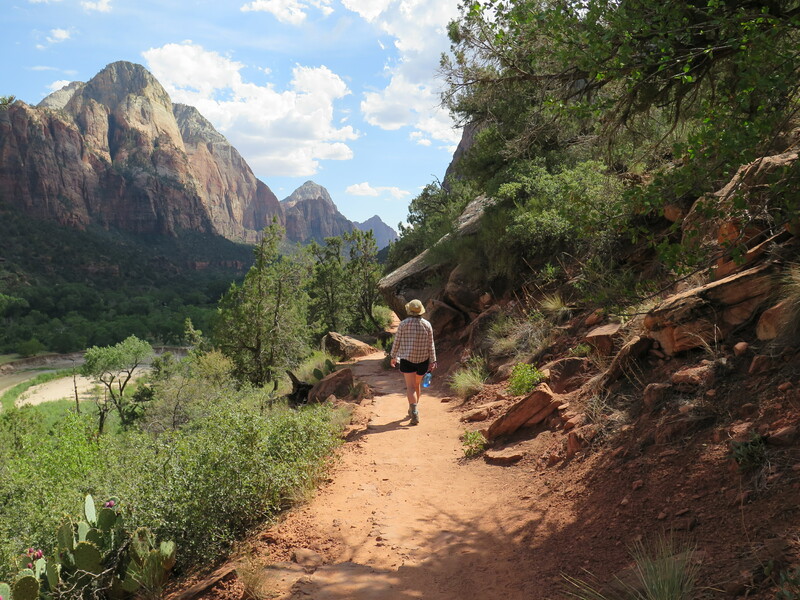 It’s one of the most used trails in the park, since it connects to the East Rim Trail and to the infamous Angel’s Landing. 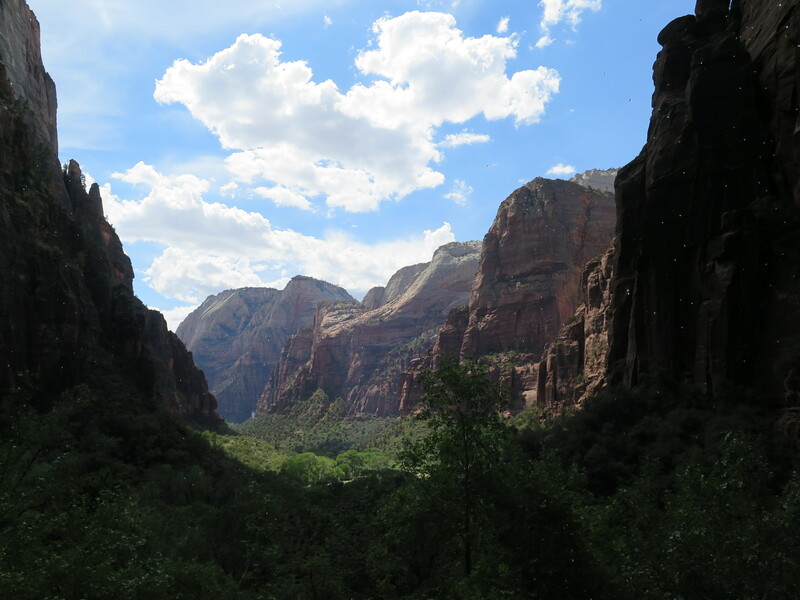 I’d say if you have only a day to see Zion (like us), than this trail is a must-do (especially from north to south). Emerald Pools were really pretty too, but goodness, that view from the Kayenta trail was unforgettable. That evening we stayed in St. George, UT using Airbnb. After a few days hiking and camping, we were both very dusty and very smelly and we both needed showers. The next day, we had planned to drive to Sedona to spend a couple days with our aunt and uncle. 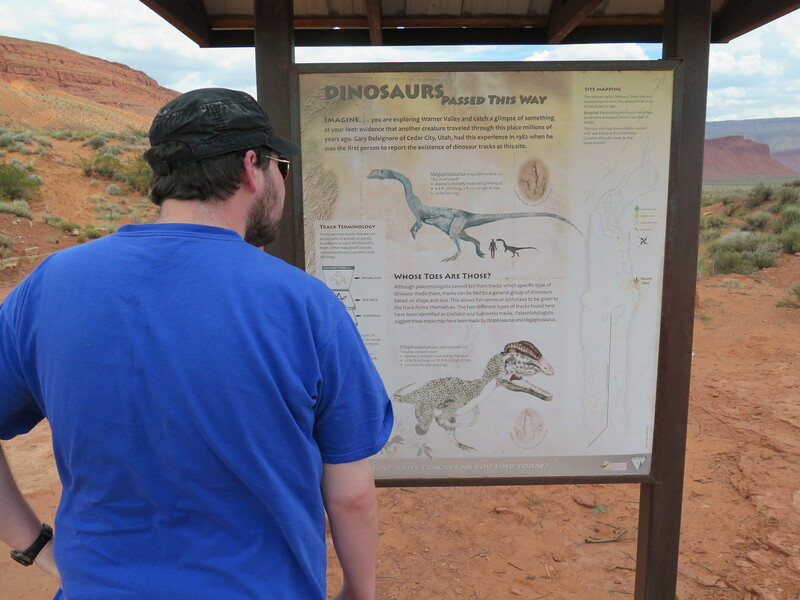 But, before our long drive, Jamie had noticed a sign about dinosaur tracks while entering the city the night before. 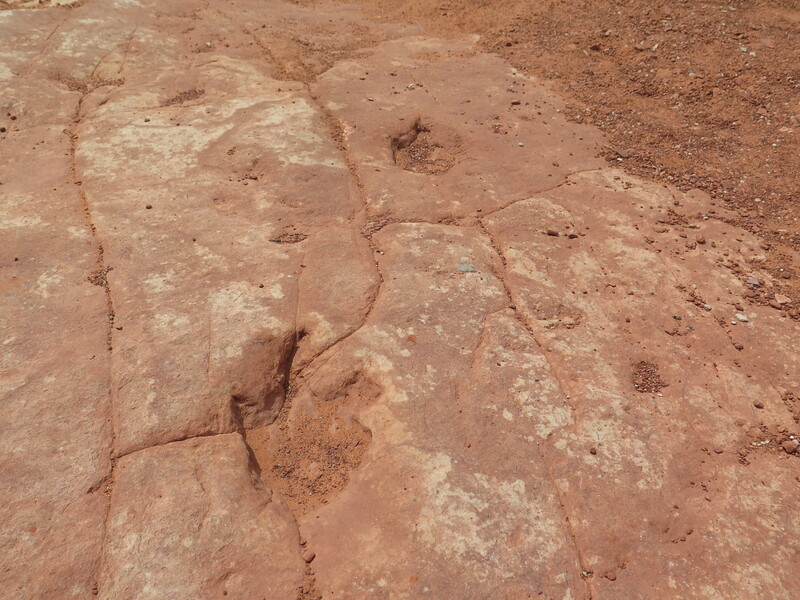 So, we did a quick google search and found the Warner Valley Dinosaur Track Site. 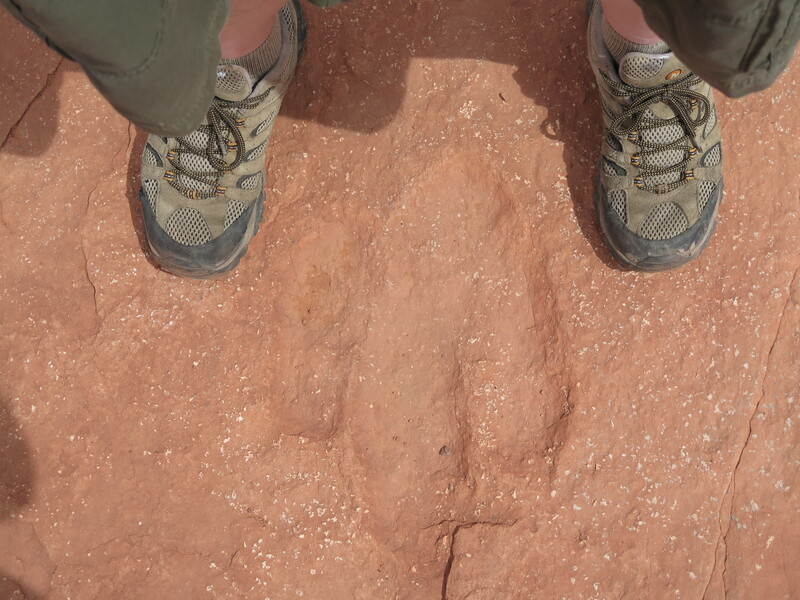 We didn’t even hesitate, within seconds I found the address and we were on our way to discover some dinosaur footprints! We found ourselves on a dirt/gravel/sandy road for over 6 miles while on our way to Warner Valley Dinosaur Track Site. We were worried we were lost until we saw signs for it. When we parked, the trail lead us down deeper into the valley. We found a sign with the history of the area and just across from it was a designated area strewn with footprints. I’m glad Jamie and I spent the time to explore this area. It was very beautiful and walking where dinosaurs once roamed was definitely the coolest part. We plan to visit larger dinosaur sites in the future, maybe even Dinosaur National Monument? Alas, all things must come to an end, so we left Warner Valley and began our 8 hour drive to Sedona. I’d like to say it was uneventful, but it was one of the scariest drives of my life! We hit a nasty storm while north of the Grand Canyon and even witnessed the beginning of a flash flood. We learned later that the flooding was very severe. I’m glad we left when we did because we easily could’ve been stranded. Here’s a video of the storm before we reached it. Thanks for reading. In my next post, I’ll write about camping in Sequoia National Forest. That would be awesome! I don’t think I’ve done that since I was 8 or 9 years old. I’ll definitely let you know if I come back for the holidays. 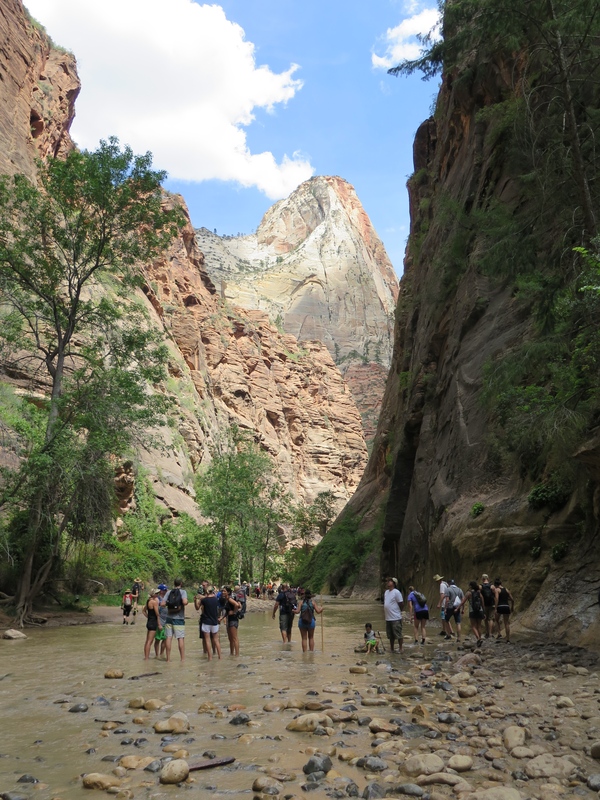 Hope you get to return and hike the Narrows, it is such a unique experience while in Zion.